Spin Stories is a special feature series sponsored by Spin Ultimate. Please support the brands that support not only Ultiworld, but the awesome women’s teams we cover. 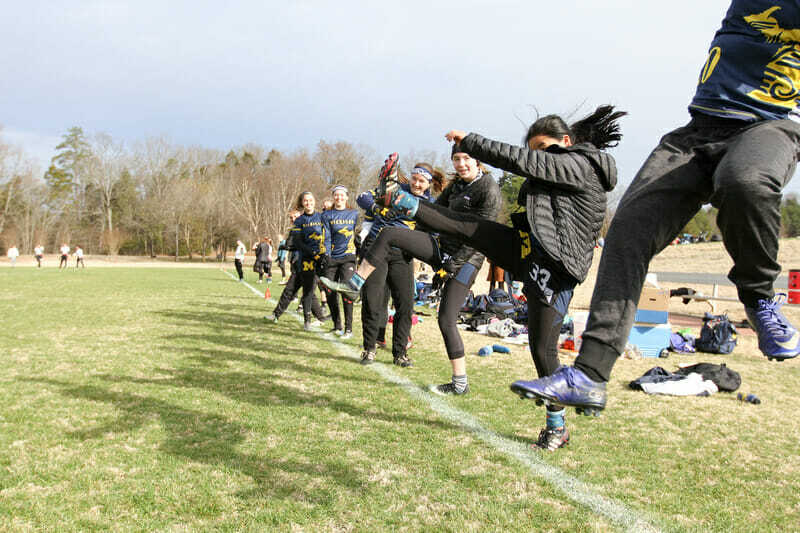 Part of the magic of college ultimate is that each season is unique. Teams are forced to constantly change and adapt, with a very limited window to play together. Virtually no team remains the same from season to season. And yet there’s a commonality to the unique journey each team takes. 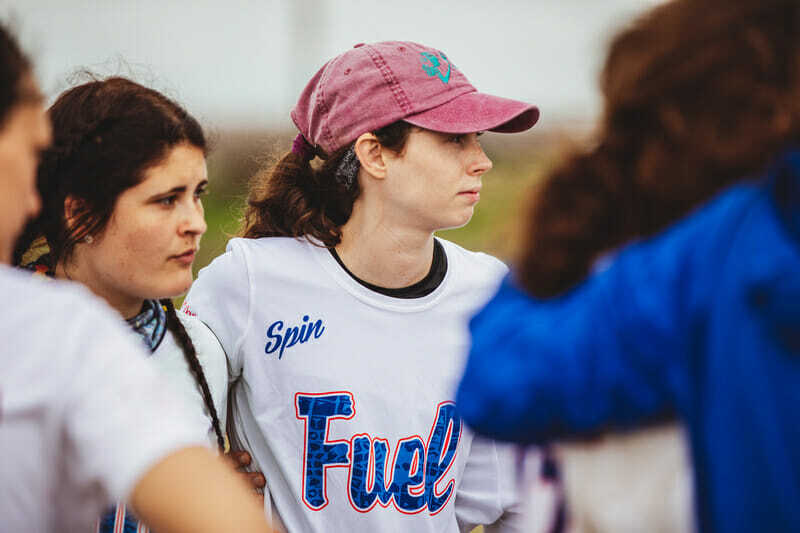 Spin Stories takes a look at three teams–Florida FUEL, Michigan Flywheel, and UCLA BLU–and follows their seasons as they traverse the challenges of trying to achieve their goals. 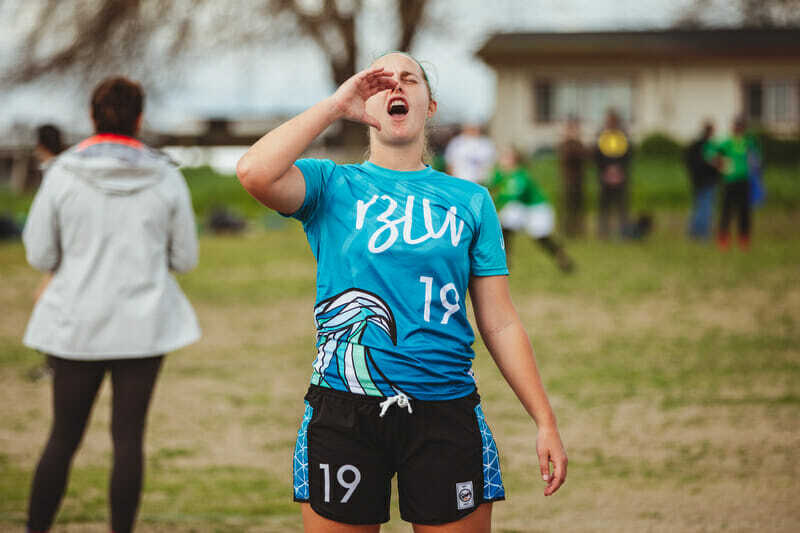 These teams, each sponsored by Spin Ultimate, will share their own thoughts and experiences, giving you an inside look at being an elite college program in the women’s division. Flywheel survived the muddy Commonwealth Cup and made it back to Michigan. They finished tied for fifth after a loss in the quarters to UNC. For anyone who needs a reminder, Saturday was 35 degrees with consistent rainfall that led to several inches of standing water on the fields for most of the day. One resource Flywheel has is a strong alumnae network. Not only do they have former players to help their online presence look extremely professional (Kari Paine is credited with their stoic headshots on their website), but they also have family of former players, like the one who lodged them when they came to Axton. This helped keep costs down and provided a comfortable touch to get them through the literal and figurative storms of the weekend. The family hosted them, fed them, and critically, provided laundry services. Flywheel has had a few bumps in the road this season. Bad weather, but also some injuries that have left a few players sidelined. The club is looking forward to Centex, their next tournament in Austin, Texas. Currently, the forecast shows scattered thunderstorms, but the temperatures are predicted to be 60 and above, which will be a significant improvement from what Michigan has dealt with so far. The leadership says that right now, they’re not worried about the weather at Centex. At the moment, they’re just excited to be done with indoor practices that end at 1 AM…although they did make some highlights in the indoor arena. It wasn’t just happenstance that took UCLA to their third place finish in Stevinson. Every high and every low both on and off the field has shaped this UCLA team, often in ways they weren’t expecting. From the start of their season, UCLA was focused on retooling their young squad. The previous year was the first time the team had missed Nationals since 2013, and the team was eager to return. There was an immediate challenge standing in their way. With a strong graduating class, UCLA was set to have a very young roster heading into 2019, and as most Southwest tournaments occur relatively early in season, UCLA didn’t have much time to work on chemistry. Bonding became an instant priority. On the field, UCLA has built-in traditions that help bring the team together, too. For every tournament, they bring an ‘O-shirt’ and ‘D-shorts’2 which have been passed down for some number of years. At the end of a tournament weekend, two people are recognized in a special way for their contributions on offense and defense respectively. They are given the article of clothing and tasked with placing a new, artistic addition to it prior to the next tournament, where they determine the teammate who will receive it next. These small details and memories have helped UCLA grow together as a unit, which has really been paying off for the team recently. That’s not to say it’s all been rosy, though. While BLU team chemistry has grown, there have been plenty of pitfalls along the way. UCLA currently sits at 12th in USAU’s college rankings, and seems to have comfortably earned the Southwest a third bid. The chances of that happening did not look good at the beginning of the season. For both good and bad, UCLA’s youth was on full display in their first tournament, the Santa Barbara Invite. The team went 3-4, playing tight with many competitors, but struggling to close out when they needed the win. Less than three week later, UCLA traveled to San Diego for Presidents’ Day. The elements and tournament format thrust them into a difficult pool, preventing them from making the bracket, or even power pools. They ended the weekend 5-2, winning outright in the consolation bracket. Their record noted the promise of the team, but by missing out on playing the best teams at the tournament, it was tough to tell. Even at the Stanford Invite, their best tournament finish to date, UCLA finished the weekend 4-3, going 1-2 in pool play and narrowly squeaking into the bracket. The finish line for the regular season is in sight for UCLA. After spring break, the team only has one more tournament scheduled — Centex, on March 23rd and 24th. Their most recent results have been promising, but BLU understands the stakes that come with these later tournaments. Together, they’ve been ramping up their intensity and feel very equipped to make the final push before the postseason. Most of all, they believe everyone has bought in. It’s not just a team effort, it’s something that every single player has personally worked towards. Since our last update with Florida FUEL, they’ve played at Stanford Invite and Tally Classic. Both tournaments had their highs and lows for the back to back Southeast regional champs, but the team has been able to maintain it’s focus and optimism through the up and down results. At Stanford, FUEL started their weekend 0-4, but ended on a high note with back to back wins over UC Davis and Whitman. FUEL’s weekend out west turned out to be a real turning point, as the captains decided to redefine their goals after seeing the team struggle to assess themselves against original goals that were deemed to be too vague. “We went from intangible things that you could reach if you were able to make tangible things happen, to more step by step tangible goals. Be a better teammate was a goal, and now we’re like ‘be a great sideline, raise the intensity any chance you get’, things like that,” said captain Charlotte Talham. “The goal of Nationals is still the goal, but that’s such a vague goal,” clarified co-captain Janina Freystaetter. So the captains re-worked that goal into measurable process. “A lot of people don’t know what that means [to make Nationals], we have a lot of new players,” explained Talham. “We changed to steps, what does it mean to make Nationals,” Freystaetter said. The team also had a neat bonding experience after Stanford, as they raced from the fields after their last game to get to Yosemite National Park just in time for the sunset. Some of them were able to stay out in California for spring break for some extra bonding time. “You have that big tournament each year, you do it for more than frisbee. That was a good point of that for the gals,” said Gabby Krajniak. “After our big heart to heart meeting out in California, I think the mindset was changed, and that was seen here,” said Freystaetter. FUEL’s regular season is now over, and they’ll turn their focus to the series. The captains all seemed confident of the team’s ability to make Nationals, despite the different feel to their season compared to the last two. They saw inexperienced players like Sydney Weiner, Gianna Arcuri, Katie Huettel, and Madelynn Lovelady step up at Tally Classic, and that’s obviously a promising sign as they gear up for a run at a third straight regional crown. It’s been a challenging season for an inexperienced FUEL team. But with adjustments from their leadership, and some bonding moments out west, they are in a positive and promising spot. Comments on "Spin Stories: An Inside Look at FUEL, Flywheel, and BLU (Part 2)"